The Conference will include a competition which gives participants an opportunity to present and showcase the innovative technologies or applications of their research in teaching and learning. Examples of such technologies include, but are not limited to: mobile learning applications, e-learning applications, courseware, learning spaces, innovative teaching and learning tools, and other innovative projects. 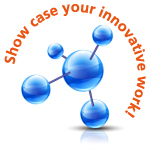 The eInnovative projects will be displayed for attendees to view and try out in a special session. Each presenter will be given 10 minutes to make a presentation on their project work. All projects presented will compete for the ‘eInnovation in Education Award’. Awards will be given in two categories: (i) Best School Project and (ii) Best Tertiary Institution Project. Two judging panels will make the final decision on who the two overall winners are. 3. the impact of the eInnovation. 4. the technical merit of the eInnovation project. For Award (i), entrants must be students or teachers of a primary or secondary school; for Award (ii), entrants must be academic/professional staff members of a tertiary institution. This competition is not open to commercial vendors. Entrants will need to provide a description of their research or the new technologies they have developed on the submission form and details for application will be announced later.